Among the Haydn recordings released in the composer's anniversary year, there's a danger that some more modest offerings might get lost beneath the tide of commemorative box sets and reissues. There's definitely such a danger with this invigorating disc of three symphonies performed by Canadian ensemble Arion under the guest direction of Gary Cooper. And it's the deliberate modesty of the forces involved that give the release its unique selling point, using forces closely approximating those that Haydn had at his disposal at Esterház. We have just half a dozen violins, then, three violas, one each of cello and double bass and a pair each of horns and oboes. Of the three symphonies on the disc, two are quintessential products of Haydn's Sturm und Drang, No. 49 in F minor 'La passione' and the magnificent No.44 'Trauer', described by Cooper in his note as 'possibly Haydn's greatest achievement during the whole Sturm und Drang period'. The disc opens, however, with Symphony No.41 in C major and this symphony will probably provoke the most controversy in terms of the performance. In recreating the Esterház forces Cooper has returned to an early manuscript that leaves out the trumpets and timpani that feature in the published score of the symphony. This changes the character of the work somewhat: we lose the pomp and militaristic connotations that are inevitably associated with trumpets and drums and the internal balance shifts onto the high horn writing that is, thankfully, despatched with considerable verve and virtuosity. As throughout the whole disc, Cooper's contributions on the harpsichord are also prominent – an unsurprising by-product of the smaller forces involved – and this further alters the way one listens to the works. Although it is possible to miss some of the grandeur in No.41, for me the sheer vitality of the playing from Arion more than makes up for it. Light on their feet and responsive, they make the listener feel privy to the musicmaking in a way that simply wouldn't be possible with a larger orchestra. It also means that in No.41's Un poco andante slow movement flautist Claire Guimond can deliver her solos with as much delicacy and subtlety as she likes, without the risk of being drowned out. In the same symphony's finale, too, Cooper can bring the players down to nothing at the drop of a hat, but loses little in terms of bite in the tuttis. The astonishing Symphony No. 49 comes second and brings similar advantages in terms of intimacy, especially in the long, moving Adagio first movement (as Cooper reminds us, the symphony's unusual formal layout is a hangover from an old ecclesiastical form). With the strings employing very minimal vibrato, there's not much sense of consolation here, even in the quieter, major-key passages. The playing has an austere beauty about it, though, before Cooper unleashes furious accounts of the Allegro di molto and the Presto finale. Probably the finest performance on the disc comes at the end, however, with a taut and exciting account of the 'Trauer' symphony. Arion give a powerful but buoyant account of the opening Allegro con brio and bring a delightful lilt to the Menuetto. The Adagio is performed with just the kind of elusive but disarming simplicity the music cries out for; listen, in particular, to their wonderful way with the brief minor-key episode starting around 4'50. Capping off this excellent performance is a Presto bristling with energy and vitality. The sound could be more detailed and a little cleaner, but it is atmospheric and realistic, capturing all the vigour of the performances. 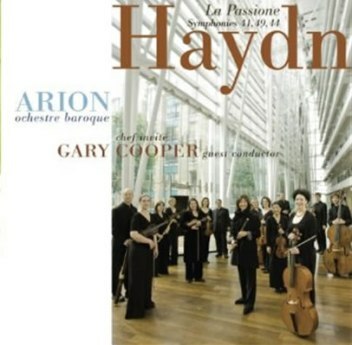 Some might quibble with the 'authenticity' of Arion's smaller forces, or question whether this experiment really does show these symphonies' closer kinship to the string quartets than the later symphonies, but there's no doubting the passion and love of Haydn's music that this disc communicates. In the end, any recording that brings Haydn to life like this is an important addition to the anniversary crop.